Harvard at Town Hall: Jared Diamond '58 on "Turning Points for Nations in Crisis" LAST 4 TICKETS! Delve into a discussion with Dr. Jared Diamond '58 - acclaimed author of multiple bestsellers, including Guns, Germs, and Steel - who will share his latest work, UPHEAVAL: Turning Points for Nations in Crisis. 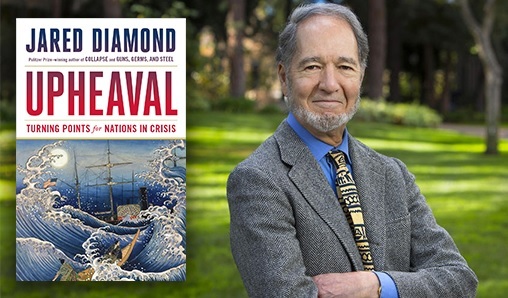 The Harvard Club has limited tickets to this Town Hall Seattle event featuring Dr. Jared Diamond '58, whose acclaimed works have earned him the U.S. National Medal of Science, a MacArthur Foundation Fellowship, and a Pulitzer Prize for General Nonfiction. Having transformed our understanding of the rise and fall of civilizations through his earlier works - Guns, Germs, and Steel and Collapse - Dr. Diamond completes this trilogy with his new book, UPHEAVAL: Turning Points for Nations in Crisis, which explores how resilient nations recover from crisis through a process of selective change. Purchase/renew membership here. For HarvardKey issues, contact Harvard IT (ithelp@harvard.edu | 617-495-7777) or email club@harvardseattle.org. Pick up tickets at the door. Sorry, no refunds after Monday, May 6. Questions? Please email Carlos Obando, MBA '83. This is a partner event, presented by Town Hall Seattle. Image from Town Hall Seattle.